Inspired by Saara/Nipsulintu's post, I decided to go for that post as well, and show you guys what I carry around in my bag on a normal day. This happened to be a Wednesday, before work, the day before an exam. No further explanations needed, I'll just move on to the pictures. First of all, the bag itself. ois bag bought this fall from Aleksi13. For the longest time I've basically only used canvas totes or my pink back pack, but unfortunately pink does not go with everything, and I can never find my keys or my wallet or my phone from among books and papers and my laptop, and totes just don't last that long. 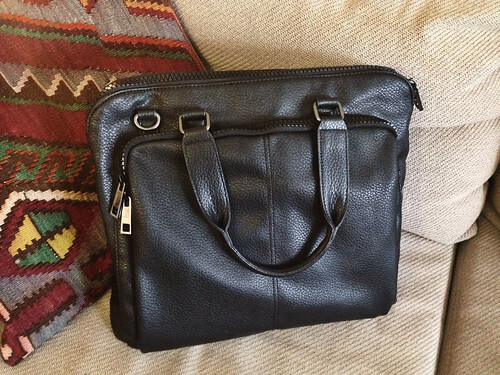 This bag has some nice compartments, including a separate laptop pocket perfect for my MacBook. So much better. And on to the contents! My brand new pencil case from (I only recently out of necessity got rid of my trusty old pencil case that I've probably had since middle school and all through high school, it had too many holes, I was losing all my pens), make up bag, university planner, and my wallet. 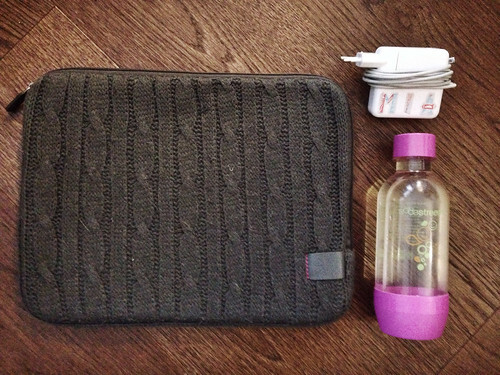 My laptop case, charger with a label so my sisters (or anyone else) don't steal it, Sodastream bottle. 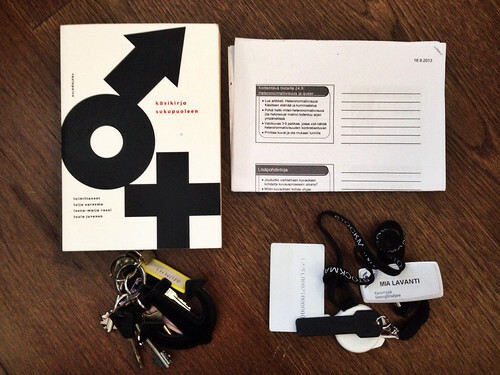 Same gender studies book as from a few posts back, hand outs for the same course, my home keys (and keys to a bunch of other places), work keys that I handed in yesterday. 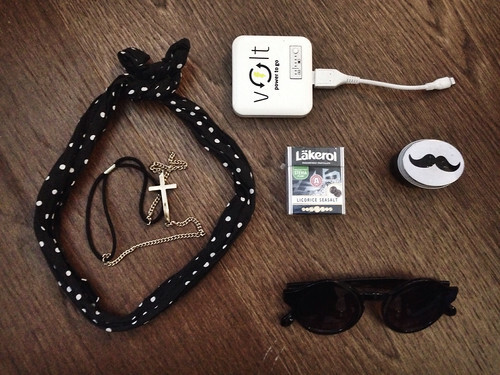 Two headbands, Volt phone charger, breath mints, painkillers in a tin, and sunglasses. What you did not need to see but will anyway: trash. 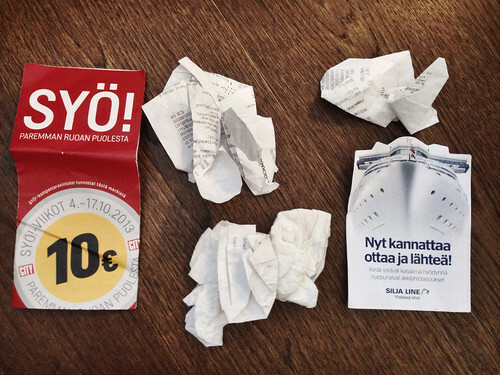 Two random flyers, old receipts and old tissues. My bag is normally a mess. 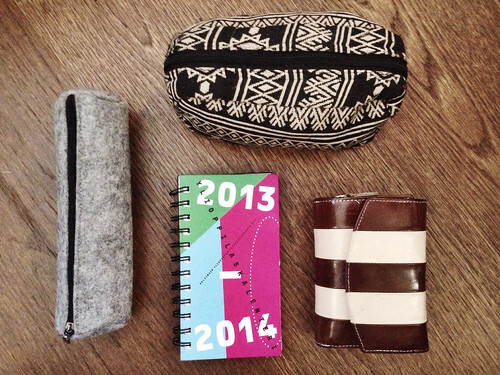 I'm one of those people who can never just bring a tiny little bag, I always carry everything with me. Maybe that's why my bag, that's only a couple months old, is starting to show some signs of wear, mainly in the strap department.... Oops. Not bad...kaikki tarpeellista. Entä lompakko?? Nojoo paitsi ehkä noi roskat :P Mut onneks heitin ne pois sit heti!